It is vitally important that you keep your bike well maintained. A well maintained bike performs at its best, is a pleasure to ride and also ensures that your components last longer. please ask a member of the Albany Cycles team. During the first few weeks of riding parts of the bike tend to work their way loose and out of alignment. This can lead to the bike performing sub-optimally leading to undue wear. For this reason we offer a first service free of charge on all new bikes purchased from us. This service should be carried out between 6-8 weeks of purchasing the bike (dependent on use). Feel free to phone us, on the above number, or pop into the store - open Tuesday to Saturday, 9am to 6pm - to arrange a suitable date and time. 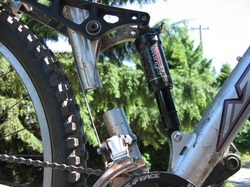 The team at Albany Cycles will be able to advise you in person regarding the requirement for Suspension Services as this will be dependent on the manufacturer of your forks.